Director Sam Raimi's Cult Horror Classic Available For the First Time Ever on Blu-ray Disc! London, UK. 04/08/10 - On October 11, cult horror classic THE EVIL DEAD rises to terrifying new life across the globe on Blu-ray Disc, courtesy of Sony Pictures Home Entertainment. Featuring digitally remastered high definition picture and sound, plus hours of innovative new bonus features, this is the ultimate way for fans old and new; good and evil; alive and un-dead to experience this groundbreaking horror favourite! Before conquering the global box office with his smash hit Spider-Man series, director Sam Raimi changed the face of horror with this spine-tingling tale of a group of college students facing off against forces of evil at an isolated cabin. At the time of its release, legendary horror author Stephen King called THE EVIL DEAD "the most ferociously original horror film of the year." Now, horror fans around the globe can experience the terror in the woods like never before with nightmarishly vivid 1080p HD picture and hauntingly crisp 5.1 Dolby TrueHD sound. In addition, this stunning new high-def transfer comes loaded with thrilling new bonus features, including all new commentary with Director Sam Raimi, Producer Rob Tapert, and actor Bruce Campbell, plus the interactive Picture-in-Picture commentary "Join Us! The Undying Legacy of The Evil Dead." Additional bonus features include the featurettes "One by One We Will Take You: The Untold Saga of The Evil Dead," "Treasures from the Cutting Room Floor," "At the Drive-In," "Discovering Evil Dead," "Make-Up Test," "Ellen and Drama Teacher" and "On-Stage Interview." 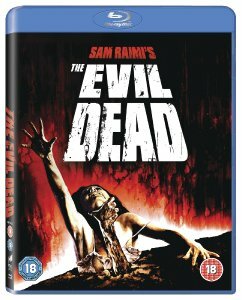 THE EVIL DEAD will be available on Blu-ray Disc for RRP £17.99. Five Michigan State University students venture into the hills to spend a weekend at an isolated cabin. There they discover an ancient Sumerian text, known as the "Morturom Demonto"; roughly translated as "The Book of the Dead." While searching the basement of the cabin, the students find and play a tape recording of demonic incantations from the book, unwittingly resurrecting slumbering demons that thirst for revenge. The characters are then possessed - one by one - by the spirits of the Book. THE EVIL DEAD was written and directed by Sam Raimi (Spider-Man trilogy, Drag Me To Hell) and produced by Robert G. Tapert (Drag Me To Hell, The Grudge). Its cast features Bruce Campbell (Evil Dead 2, Army of Darkness), Ellen Sandweiss (My Name is Bruce), Hal Delrich (Crimewave), Betsy Baker (TV's "Southland", "E.R.") and Sarah York (TV's "Dangerous Women"). It has a run time of approximately 85 minutes and is rated 18. The Blu-ray Disc version of THE EVIL DEAD is BD-Live enabled, allowing users to get connected and go beyond the disc via an Internet-connected Blu-ray player and download content.